Military and literature buffs should enjoy The New 22, a free Arkansas Literary Festival program, Thursday, June 20, at 6:30 p.m., at the MacArthur Museum of Arkansas Military History, 503 East 9th Street. 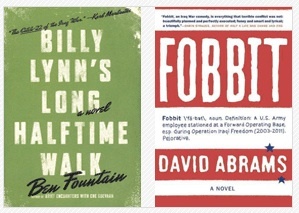 The New 22 is a panel discussion featuring authors Ben Fountain, Billy Lynn’s Long Halftime Walk, and David Abrams, Fobbit. These books have been compared favorably to Joseph Heller’s influential novel Catch-22. Set in Dallas and Baghdad, respectively, the novels offer satirical takes on some of the hard contradictions soldiers face. A reception and book signing will follow the program. Both books will be available for purchase. Ben Fountain is an award-winning author whose debut novel, Billy Lynn’s Long Half-Time Walk, received numerous awards including the National Book Critics Circle Award for fiction. David Abrams, who retired in 2008 after a 20-year career in the active-duty Army as a journalist, has received several military commendations including being named the Department of Defense’s Military Journalist of the Year in 1994. His debut novel, Fobbit, was named a New York Times Notable Book of 2012 and a Best Book of 2012 by Paste Magazine, St. Louis Post-Dispatch, and Barnes & Noble. The Arkansas Literary Festival is a program of the Central Arkansas Library System (CALS). The New 22 is sponsored by the MacArthur Museum of Arkansas Military History. The event is free and open to the public; reservations are requested. Please RSVP to pedwards@cals.org or 918-3009. For more information about the Arkansas Literary Festival, visit www.arkansasliteraryfestival.org. This entry was posted in Lecture, Literature and tagged Arkansas Literary Festival, Ben Fountain, Billy Lynn's Long Halftime Walk, Catch-22, Central Arkansas Library System, David Abrams, Fobbit, Joseph Heller, MacArthur Museum of Arkansas Military History, The New 22 by Scott. Bookmark the permalink.